Long ago, a guide book was made to help visitors find their way around Viet Nam. It had information about interesting places as well as advice on how to travel. Now, it has been printed again. It is being sold at book stores all over the country. A classic travel guide authored early in the 20th century has been reprinted, offering readers the opportunity to travel back in time and experience yesteryear Hà Nội in minute detail. Nhã Nam Books, in co-operation with Hà Nội Publishing House, has brought out a new edition of the original Hà Nội Chỉ Nam (Hà Nội Travel Guide), considered a thorough guide book in the early 20th century. Authored by Nguyễn Bá Chính, the guide book was first printed in 1923 with clear information about Hà Nội’s tram routes, railway, roads, restaurants, hotels, pharmacies and tailors. Apart from the wealth of information, the book also encouraged readers to follow the writer’s choices and recommendations. “This is a new guide book written in the Romanised Vietnamese script, targeting Vietnamese people, travellers and enterprises as the demand for travel keeps increasing in such a beautiful city, which will be a big market soon,” Chính wrote in 1923. The book lists four tram routes in the city, all starting from Hoàn Kiếm Lake. It notes: “A one-way ticket on leather seat costs 4 cents; ticket for a normal seat, 3 cents; ticket for children 3-7 years old, 2 cents. A return ticket on leather seat costs 7 cents; on normal seats, 5 cents; for children 3-7 years old, 3 cents. The guide book also lists distances between Hà Nội and other provinces, details of rail routes and information on how to buy tickets. 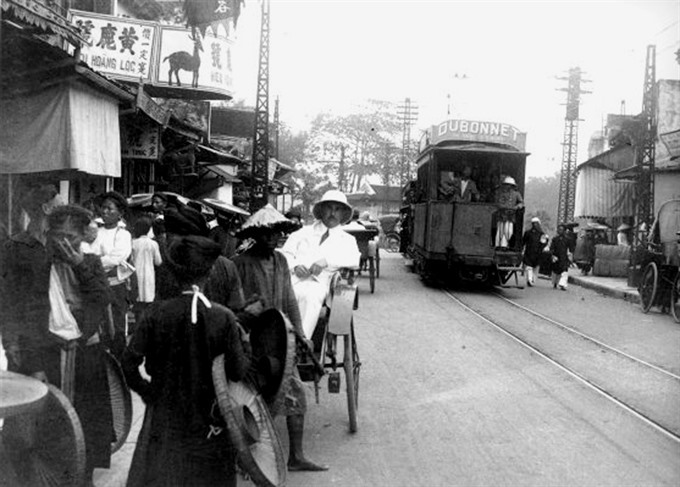 The book clearly sets out the rail route from Hà Nội to Yunnan (China) and procedures to get a pass for both French and Vietnamese people. The readers were advised to submit the pass form to French authorities in the Hà Khẩu (border area with Yunnan, China in the northern province of Lào Cai) three days before departure. “It’s a bit of an exaggeration to call this a historical or anthropological document as it is a travel guide,” researcher Phan Phương Thảo of the History Department, Hà Nội University of Social Sciences and Humanities, told Thanh Niên (Young People) newspaper. She noted further that Hà Nội Chỉ Nam lays out clear travel routes, highlights beauty spots within the city, on its outskirts and further. The Hà Nội Opera House is introduced thus: “Locating at the head of Tràng Tiền Street, an outstanding, magnificent building is the so called ‘Municipal Theatre ’. The information on Hoàn Kiếm Lake states that the Lê Dynasty (1427-1789) used the lake as a site for training marine forces. That’s why the lake used to be called “Hồ Thủy Quân” (Naval Lake). The book tells the reader where she/he can get photographs taken, buy souvenirs, leather goods, jewelry, silk, cloth, etc. In the part for restaurants and accommodation, the writer divides the establishments into three categories: westerners, Chinese and Vietnamese. The list for western restaurants is led by Hotel Metropole. The writer has clearly opted for big restaurants with tasty and hygienic food. The 155-page book, costing VNĐ50,000 (US$2.2) is available in book stores throughout the country. Đỗ Đình Hồng, director of Hà Nội Tourism Department said the department intended to publish a new guide book, which may contain the same subheads. The accommodation list may contain 5-star, 4-star, 3-star, homestays and apartments. Just as yesterday means the day, or days, before, yesteryear means years before. Minute detail means a focus on the smallest of things. A new edition of a book is a new version of a book that may be a bit different to an earlier version. Recommendations are things you may advise people to do. Roman is a type of writing. The readers were advised to submit the pass form to French authorities in the Hà Khẩu (border area with Yunnan, China in the northern province of Lào Cai) three days before departure. If it is an exaggeration to call the travel guide a historical or anthropological document, it is made out to be more of a historical or anthropological document than it really is. Anthropological means to do with anthropology, which is the study of human societies. Concrete, in this case, means solid. The outskirts of a city are the areas on the edge of the city. Pillars are columns that support the rooves of buildings. The foundation of a building is the hard, strong material on the ground on which it is built. “Dubbed” means “given the nickname”. The statue was given a royal robe by King Thiệu Trị (1807-1847) during his trip to the north. A robe is a piece of clothing that hangs on your shoulders. Marine means to do with the sea. Souvenirs are gifts you buy to remind you of a special place. A subhead is a small heading. The new book, to be published later this year, will also have information on venues for art shows. Venues are places where performances and other activities are held. Researcher Phan Phương Thảo says it is no exaggeration to call the guide book a historical or anthropological document. The guide book was first printed in 1923. The Hà Nội Opera House was built in 1910. The statue of Huyền Thiên Trấn Vũ is also known as the statue of Black Copper Saint. 1. False; 2. True; 3. False; 4. True; 5. True.